Wedding day photography tips every couple should know. Let's face it, planning a wedding is stressful. There are a lot of things to think about and only so many hours during the wedding day. Much has been written on the subject, but most is from the point of view of a wedding planner or the bride. We thought we'd share what it's like from the viewpoint of a professional wedding photographer, giving you a few ideas to ensure the best possible outcome for your wedding pictures. For a wedding photographer, there are five distinct areas during a wedding that need to be covered adequately in order to tell the couple’s story. The areas (not necessarily in order) are: "Getting Ready," "Bride and Groom Session," "Family and Bridal Party Session," "Ceremony," and "Reception." Each of these areas has its own challenges. So, when planning your wedding, it is important to understand the challenges faced by wedding photographers. Time management and setting the right priorities are crucial for ensuring the best coverage. An often-overlooked part of the wedding day that can create havoc with your schedule is "Getting Ready.” It is essential for setting the mood for the day. For many wedding photographers, this is one of our favorite times to shoot, as this is the time when we introduce ourselves to the bridal party and the family and try to get to know people a little, which allows us to create more intimate imagery. The "Getting Ready" part of the wedding is also the time when photographers cover important details, such as the wedding dress and rings, which are essential to telling the story of your special day. One of the biggest mistakes we have seen couples make over the years is that they underestimate the time it takes to get ready, and how easily that part of the day can influence the overall schedule. Give yourself plenty of time here, and create enough of a buffer so that, in case something does not go as planned, it will not have a domino effect on the rest of the day. Another mistake we see couples make is that the bride and groom get ready at completely different locations. (And by this we mean you can't walk, or take an elevator or golf cart from one place to the other. For instance, the bride is getting ready at the hotel where the wedding is and the groom is getting ready at home.) This can create logistical problems for photographers as, depending on how the day is unfolding, it’s difficult to cover both bride and groom getting ready, and to be able to go from one spot to the other in a timely manner. 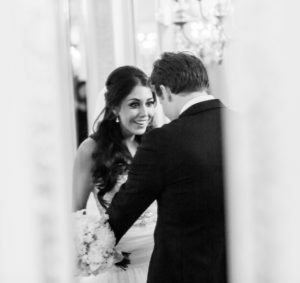 Nowadays, many couples will have what is called a "First Look," where they see each other once they are all decked out in their finery, often hours before the wedding. We always set up the "First Look" in a way that keeps this very special time intimate and personal. 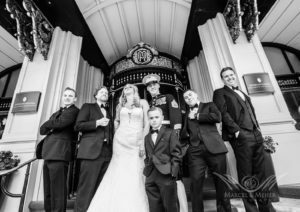 Having a "First Look" has its advantages; mainly, more time for creative bride and groom portraits and bridal party pictures that can be done pre-ceremony, allowing for a smoother post-ceremony schedule. For those couples that are more traditional and want the first look to be at the ceremony, consider that the time allowed to take photos with just the bride and groom will be significantly diminished. In the latter scenario, the only time to shoot all the family portraits, bridal party images, and bride and groom portraits will be during the cocktail hour. If that sounds stressful, imagine the stress your photographer will be under. Oh yeah, and this is also the time photographers will shoot the close-ups of the table settings and the reception site (unless those were ready much earlier in the day). Extending the cocktail hour on the fly on the wedding day is often out of the question, as the caterer is also on a tight schedule. As you can see, having a first look and getting some of the photo sessions done earlier is a big help for everyone involved. Of course, there are certain types of weddings that have a different schedule; for example, having a church wedding, where the reception is in a different location several hours later. 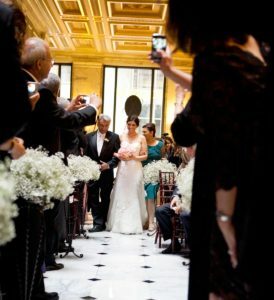 A wedding like this will allow for more shooting timeafter the ceremony, making a "First Look" not entirely necessary. 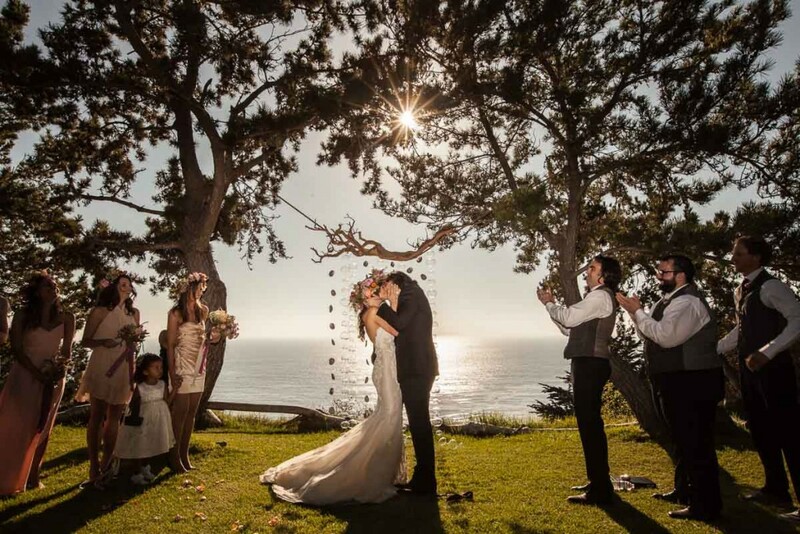 The ceremony picture featured here is backlight with a tremendous glare from the ocean, pushing the limits of camera and lens. We used flash to compensate for this extreme situation and were able to create this dramatic mood. Even though we love to use light modifiers, in general, photographers like to limit the use of flash when possible. When you hire a professional wedding photographer you expect them to be able to deal with most lighting situations. But here is a secret, there is one outdoor lighting situation that is every photographers nightmare, and that is the half sun - half shadow wedding ceremony. While the human eye can deal with this contrast, a camera sensor has a really tough time. So when choosing your venue, make sure you take into account the time of day you plan to hold your ceremony and what season you will be planning your wedding. 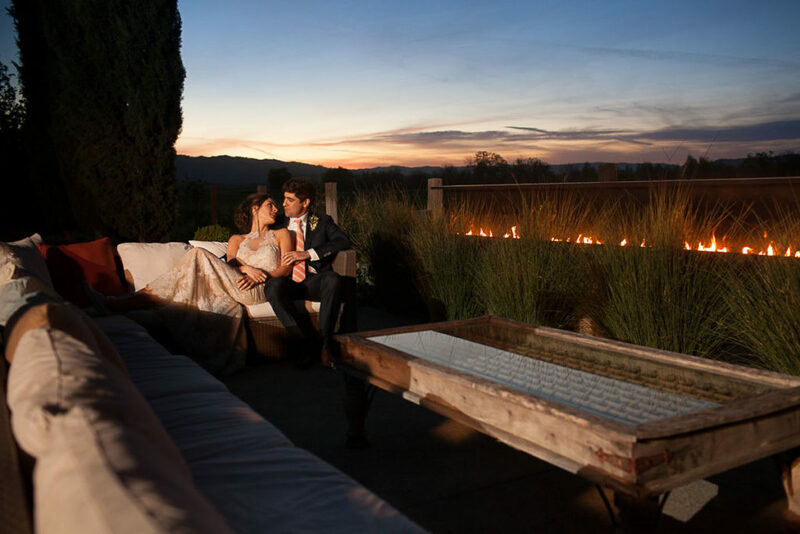 Many couples choose their venue during a different season than the one in which they actually celebrate their wedding. If you pick your venue in the fall where days are shorter, colors are in abundance and the light is magical, don't expect the venue to look the same in the midst of summer. As for lighting, full shade is the most desirable, backlight is okay, full sun is is okay too, but a half-sun, half-shade situation is the most challenging. Coordinate with the venue about what times of the day in a given season are best and look at ceremony pictures of the different venues. And remember, even indoor venues can be influenced by outdoor lighting. Perhaps one of the biggest pet peeves photographers have is the overuse of guests’ smart phones. There is nothing worse than Aunt Thelma stepping into the church aisle right in front of the photographer while he is waiting for that perfect moment. Over the last five years, smart phone use during weddings has become prevalent. I cannot stress enough how many great moments are not captured because a guest sticks his smart phone into the shot. Often guests will shoot during formals too, distracting those being photographed, which often results in having people look different ways on pictures. 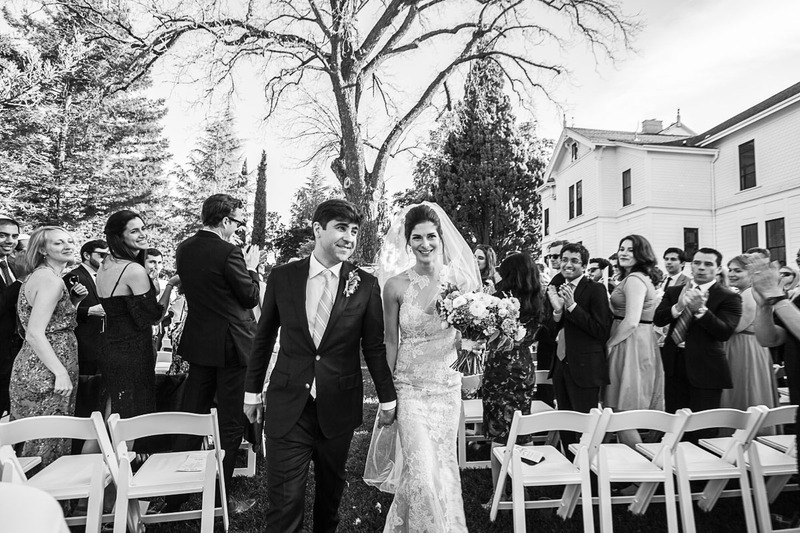 But besides the difficulties smart phones present to photographers, guests are often so enamored with their phones that they don't fully experience the couple’s special day and are, at the very least, distracted and distracting. We have even seen parents fiddling with their smart phones, thus missing their children's first kiss. We highly recommend putting a curfew on smart phones -- at least during the ceremony. One of the most important sessions of the day is the family portrait session. We cannot stress enough how important this session is and how crucial it is to keep it organized. The family portrait session is normally photographed right after the ceremony, as all the family members are certain to be present (and well-behaved). Having a printed shot list is crucial here. We go over the “must-have” family shot list with our couples, but of course every family is different. Keeping the shot list short and sweet is key here. Communicate beforehand with everyone who will be part of the family session, and make sure they know to stay put. Having someone who knows the family and can help organize the different groups is extremely helpful. Guilt is also a great motivator: nobody wants to be responsible for the family photo session taking away from the happy couple's photo session -- so use that, if necessary! A well-planned family session can be done in 15 minutes, but when chaos ensues, the session can take up most of the cocktail hour and nobody wants that. Every wedding is different and poses its own individual challenges. It is always a good idea to consult with your wedding photographer before finalizing your schedule to review the key events of your wedding and discuss some potential snags you might run into. Give yourselves PLENTY of time to get ready. Always schedule more time for hair and make up than you think it will take. 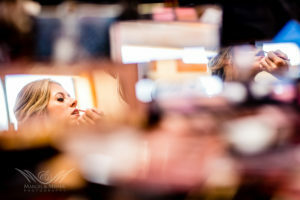 If you want groom "Getting Ready" shots, make sure you get ready at the same place or are close by. Don't do your own hair and makeup. Makeup for photography and video is a different beast than everyday makeup. To look great in pictures, a great stylist is essential. Do a trial run with your makeup artist to be confident their style meets your needs. If you have a packed wedding schedule and a limited time frame, try to have a "First Look." Get a good wedding planner and never try to manage your own wedding. We have seen it and it is never pretty. If you don't have a "First Look," extend the cocktail hour as part of the plan. Who says it must be precisely one hour? Adjust the menu a little, add some extra appetizers, maybe add some games (guests love that). The extra half hour to an hour can go a long way. Check your ceremony site during the season (if possible) and time in which you want to get married. Make sure the ceremony site is not half in the sun and half in the shade. Same holds true for indoor sites that have large windows. If you have a church wedding inform yourself about restrictions placed on photographers. If you are getting ready off-site, make sure you understand the traffic situation on the day of your wedding, especially here in the San Francisco Bay Area. We have had couples get stuck in traffic because of ball games, the Blue Angels or other civic events. Spice up your wedding venue with some extra lighting. Discourage use of smart phones during the ceremony. Your guests may ruin some of the best moments. Last but not least, if excellent photography is important to you, don't let your uncle or friend shoot your wedding. We have heard too many horror stories. Feel free to comment or ask questions in our comment section below.